Mom said it a thousand times , “everything in moderation.” So smart and so true. Too little or too much of anything is not a good thing. Take sodium…a diet too high in sodium is bad, we know that, but a diet too low in sodium is equally as bad. We know that too much sodium can lead to high blood pressure, yet too little sodium has been linked to heart attacks and a higher risk of stroke. Clearly sodium isn’t a cut and dry subject and it can be challenging to sort through the latest info. So, let’s start with the basics. What is sodium? It is an essential mineral, which means your body doesn’t make enough of its own supply naturally, so you must meet the need with food. 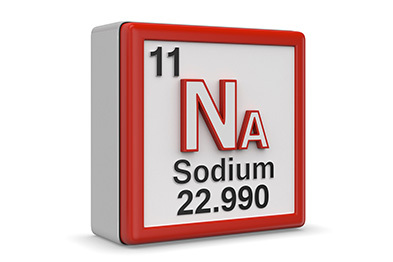 Sodium performs several critical functions including allowing muscles and nerves to work properly. It also regulates the delicate balance of fluids in your body, helping to maintain a proper blood volume and blood pressure. So, where exactly can we get sodium? One place is from salt. Note though many people use the words salt and sodium interchangeably, but they aren’t the same. Sodium is a component of salt, which is technically called sodium chloride because it’s made up of 40% sodium and 60% chloride. Because sodium is a mineral, it also occurs naturally in some foods, but is often added to processed foods. Data shows that roughly 70% of an average American’s sodium intake comes from processed foods and if you start looking at the milligrams of sodium per serving on nutrition labels, you’ll see why. One cup of canned soup (not the whole can) can contain more than 900 mg. A quarter cup of bottled salad dressing or a frozen low-cal entrée can each contain nearly 700 mg, while a whole frozen pizza typically has more than 1,600 mg. Even foods that don’t seem salty can pack a lot of sodium. A blueberry scone, for example, may contain more than 750 mg. However, fresh whole foods tend to be low in sodium. Raw spinach only provides 24 mg per cup, and a cup of chopped raw celery packs 81 mg. So how much sodium should you be consuming each day? The USDA recommends 2,300 mg for healthy adults. However if you have hypertension or increased risk of high blood pressure, chronic kidney disease, diabetes, are of African-American decent, or over 50 the daily recommendation is 1,500 mg. To put this is prospective, a teaspoon of salt contains approximately 2300 mg of sodium. It’s best to get your sodium from whole foods and salt and not from processed foods. Cutting back on processed foods will slash your sodium intake considerable and will improve your overall diet. While many fresh, whole foods do contain some sodium, it’s okay to use a few shakes or a small pinch of sea salt after cooking, especially if you’re concerned about reaching your body’s sodium needs. That said, try to be consistent. An erratic intake of sodium may cause water retention, which can trigger bloating. And even if you use some salt for flavor, keep on seasoning your food with natural herbs and spices, which add extra antioxidants to your meals. Bottom line: Balance is best, so avoid the extremes of gobbling up too much processed food or being sodium-phobic. Instead, work on developing a healthy eating pattern you can stick to for the long haul. See? Mom was right. Everything in moderation!